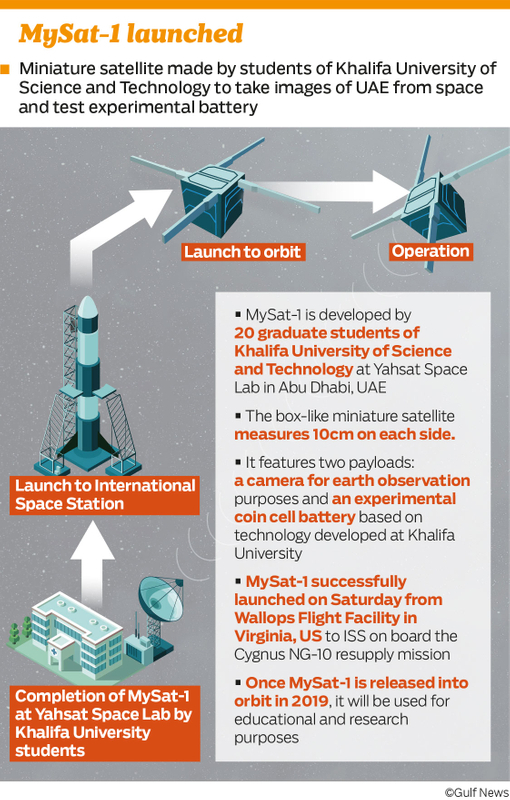 Abu Dhabi: MySat-1, a new satellite developed by students of UAE-based Khalifa University of Science and Technology, was successfully launched to the International Space Station (ISS) on Saturday, officials have announced. Once in orbit in the beginning of 2019, the miniature box-like satellite will take pictures of the UAE and the earth from space for educational earth observation purposes. Besides demonstrating the process of remote sensing, the satellite’s payload includes an innovative lithium-ion battery developed at Khalifa University to be tested in the extreme temperatures and radiation in space. Saturday’s milestone follows last month’s launch of KhalifaSat, the first all-Emirati made satellite developed by the Dubai-based Mohammad Bin Rashid Space Centre for earth observation. The much smaller MySat-1 – measuring just 10cm on each side – is developed in the Yahsat Space Lab in Abu Dhabi by 20 students of Khalifa University. 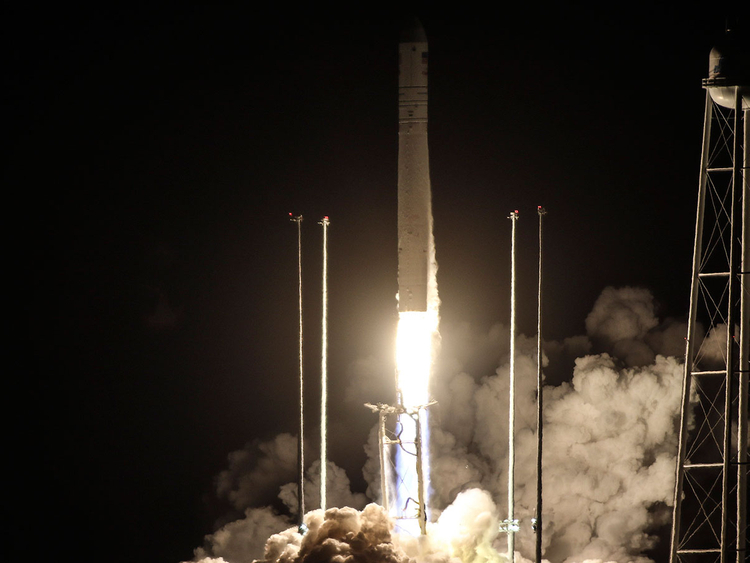 Yahsat, the UAE-based global satellite operator, Khalifa University, and Northrop Grumman Corporation, a leading global security company, on Saturday announced the launch of the MySat-1 to ISS on board the Northrop Grumman Cygnus spacecraft. The launch took place at the Wallops Flight Facility in Virginia, US and was attended by a group of Khalifa University students and faculty who have participated in the development of the nanosatellite, also known as CubeSat. MySat-1 is the first CubeSat built at the Yahsat Space Lab at Khalifa University. The laboratory was launched in 2017 at Masdar Institute in collaboration with Yahsat and Orbital ATK – part of Northrop Grumman – to develop and advance technologies within the space sector in line with the UAE’s space ambitions. The lab offers students of Khalifa University’s Master’s Concentration in Space Systems and Technology the facilities required to construct, test and launch miniature satellites called CubeSats, as part of the university’s Small Satellite Programme. The high-tech and specialised facilities serve as a platform for future research in space technologies, allowing entities like the UAE Space Agency to work with the faculty on collaborative projects. “The launch of MySat-1 is the culmination of the hard work on the part of the Khalifa University students over the past three years. Northrop Grumman is proud to have provided subject matter experts and mentors and we congratulate all the students involved in reaching this important milestone,” said Frank Culbertson, president, space systems group, Northrop Grumman.